After a mild enough winter so far, the chill has finally arrived and I've been getting emails and pm's about keeping warm in this colder weather. There are many options available. depending on your needs and budget, so I'll outline below some tips my clients have found useful! ​So you guessed it - layers are best when babywearing - for both yourself and your little cherub. Depending on how cold it is outside, you can adjust the number of layers accordingly. General rule of thumb would be normal indoor clothes and an extra layer for outside such as: woolen cardigan or fleece hoody, hat or baby hood, baby leg warmers or an extra pair of socks or tights under their trousers. There are also fleece rompers that are not padded and are suitable for using with a sling. The extra outdoor layer, which can be used as handy as wrapping a blanket around the sling. (Huge thanks to Josie for this beautifully knitted star blanket for our little Réiltín). Even an oversized hoody that you can zip up over both of you would work well too! 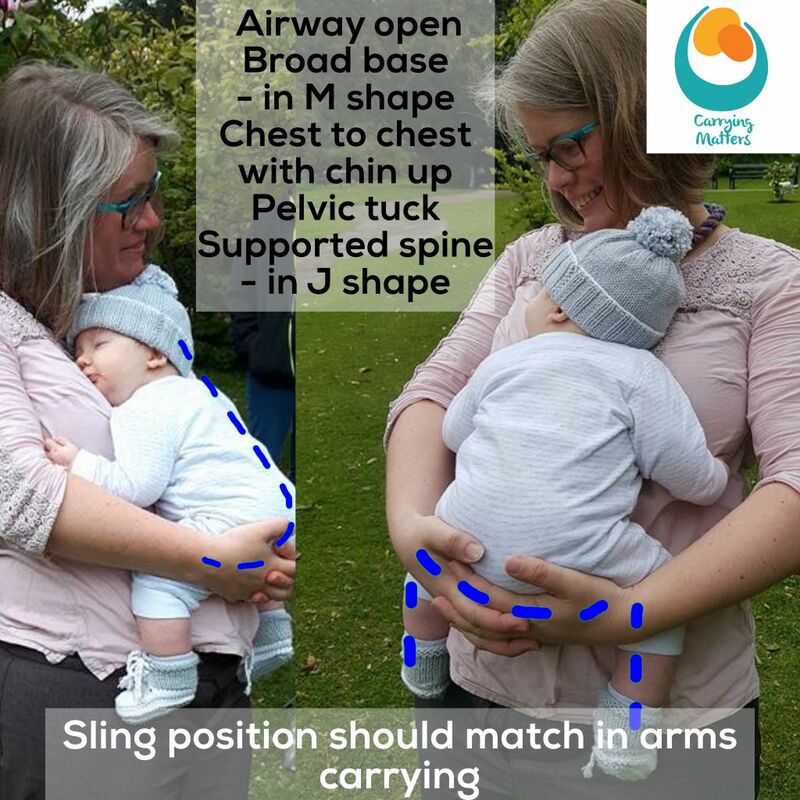 A babywearing cover can be worn over the sling and then put your own jacket on, which can be zipped up a bit, keeping your baby's legs warm too. A babywearing fleece or waterproof jacket can be worn with your baby on your front and some also have the option for you to carry them on your back too. Most come with a maternity insert, making it an all-round great buy. Generally the fleece jackets would be ok in a very light shower but you would need to have an umbrella with you in case you got caught out in a downpour. The softshell waterproof jackets are great for all weathers and will keep both of you lovely and dry even in bad rain. ​Like me, you might find a fleece all-in-one romper suit really handy for toddlers that love to be up and down and up again as they have a wander around and then want carried soon after as little legs tire easily! These baby hoods are great for keeping kids warm and protected from the elements . They tuck right down into the sling, keeping your little one's chest and back warm. Little hands can't pull these hoods off as easily as they might a hat! They can be used with baby leg warmers on legs and arms to keep those extremities warm in milder weather or with cardigans/hoodys/rompers in colder weather. ​Babywearing booties will keep your baby's legs and toes warm on cold days. Legs that stick out of the carrier or sling are prone to getting colder quicker so these handy add on's can help prevent that. It's best not to dress your little one in a snow suit or puffy jacket while in the sling due to the risk of compression, which means you cannot ensure your baby's airways are open and protected, the risk of overheating is also greater and due to the very nature of the puffy suits, it's almost impossible to obtain that optimal "M" positioning that will keep your baby comfortable and seated safely in the sling. Some scarves might obstruct your view of your baby or might get in your baby's way . Look at using a plain scarf or a circular or infinity neck scarf that are usually made with fleece or cloth and don't have any tassles, frays or decorative embellishments that may come loose. Remember to remove the layers when you go indoors, even if your little one is asleep. They'll get too hot indoors with central heating on. I tend to only close the top 2 or 3 buttons of a cardigan so that I can open it easily and can gently remove it without wakening my sleeping baby! A blog about my babywearing adventures and some photos of the various slings and carriers I own, use or have available for hire.